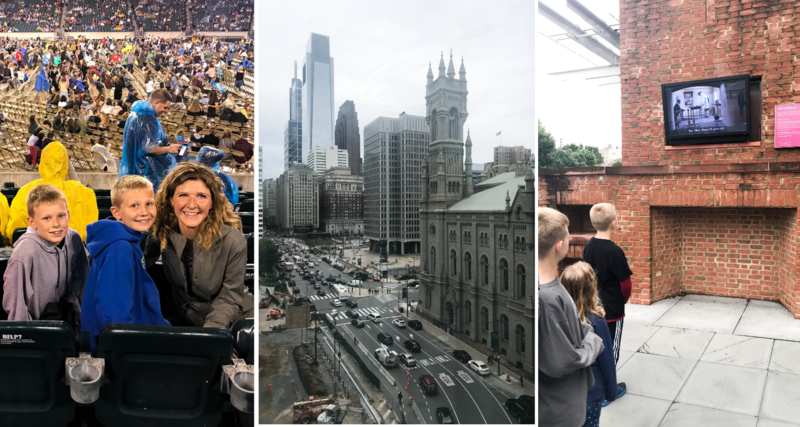 We booked a concert for the entire family to attend this past fall in Philadelphia, PA. We didn’t realize that we’d love exploring the city just as much as the concert itself. We wish that we could have built in a few more days to see the sights and enjoy the delicious food. We will definitely sneak back to the city of brotherly love for another visit soon. 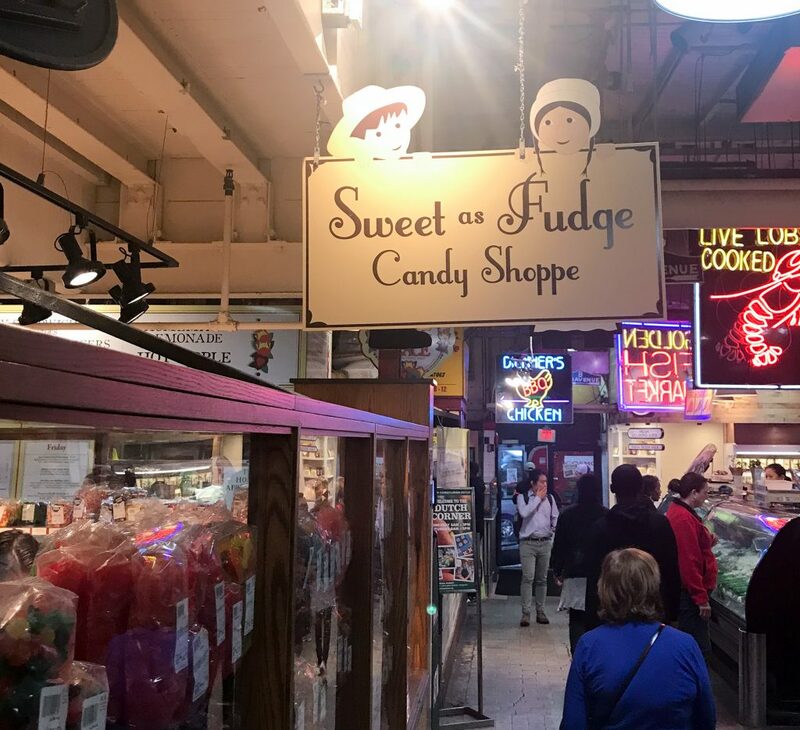 If you’re thinking of traveling to Philadelphia soon, be sure to check out our favorite spots so far. 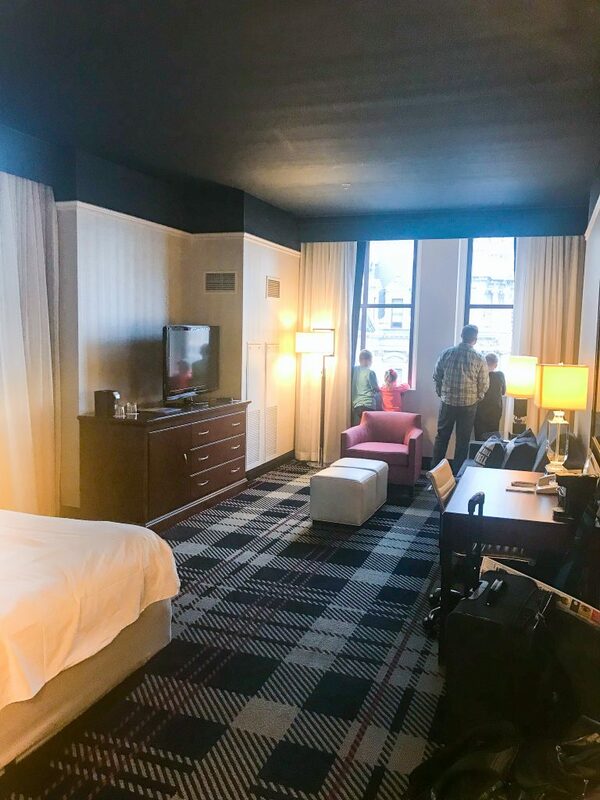 We stayed at the Courtyard Marriott Downtown Philadelphia . Our room was very spacious and with the pull out couch fit our family just perfectly. Everyone enjoyed watching the busy city below from the gorgeous windows. 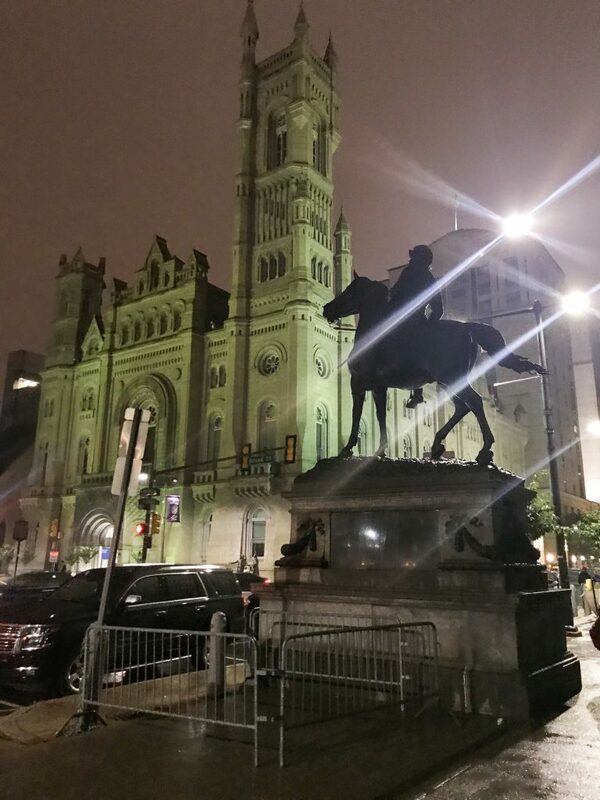 You can check out details on other downtown properties around Philadelphia here. 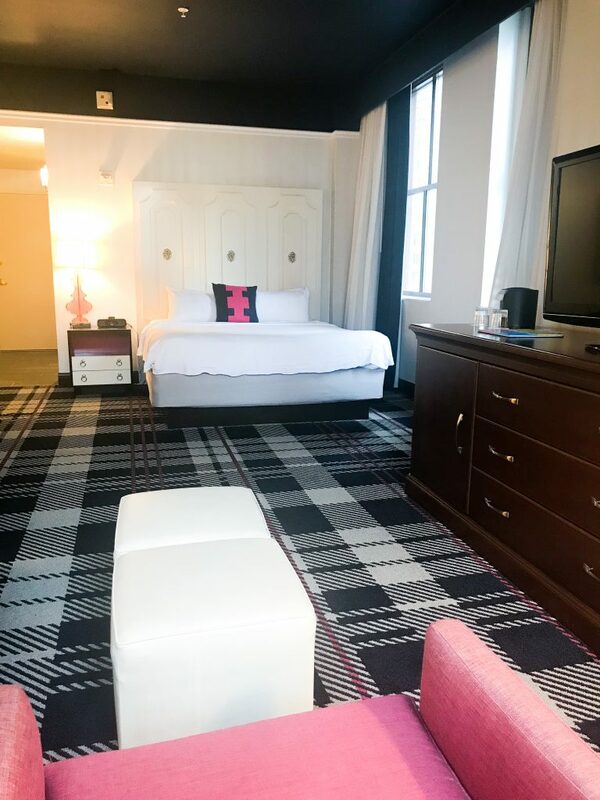 The property was very well kept and convenient to shopping, restaurants and the SEPTA Transit (Southeastern Pennsylvania Transportation Authority). The SEPTA transit system is Philadelphia’s bus, subway and commuter-rail systems. You can check out a transit map here and here. In addition, Philadelphia is an extremely walkable city. Pack your walking shoes so you can enjoy all of the sights along the way. 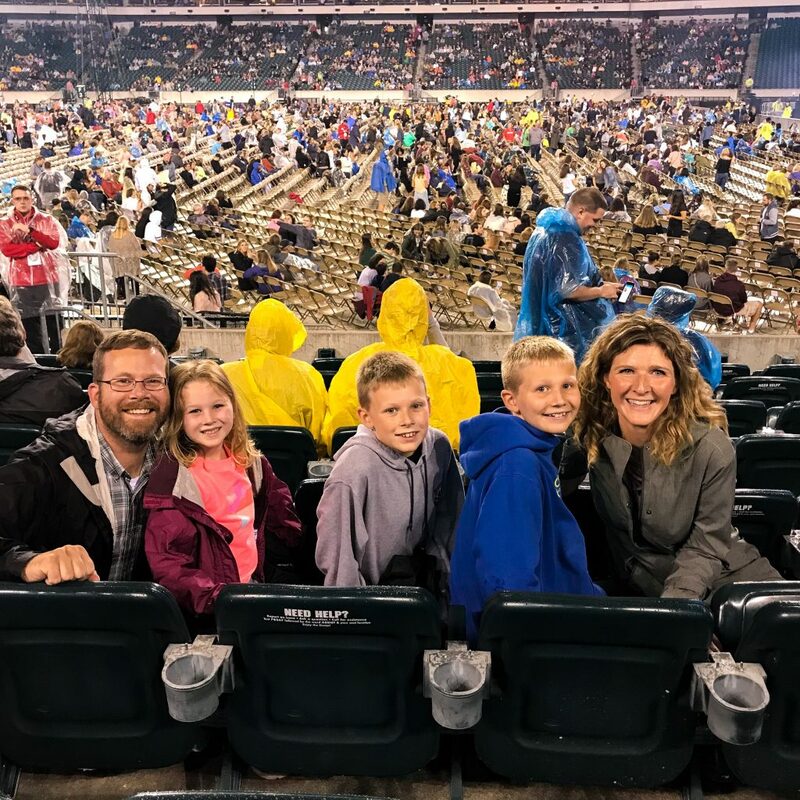 We were attending a concert at the Lincoln Financial Field. Before attending an event make sure that you check out the venue’s bag policy. They have restrictions on the size of bags and items that can be brought into the stadiums. A lot of them will allow clear plastic stadium bags like this one. The rain rolled in a little bit but we had ponchos with us and stayed perfectly dry. The next day we set out on foot to explore the city. 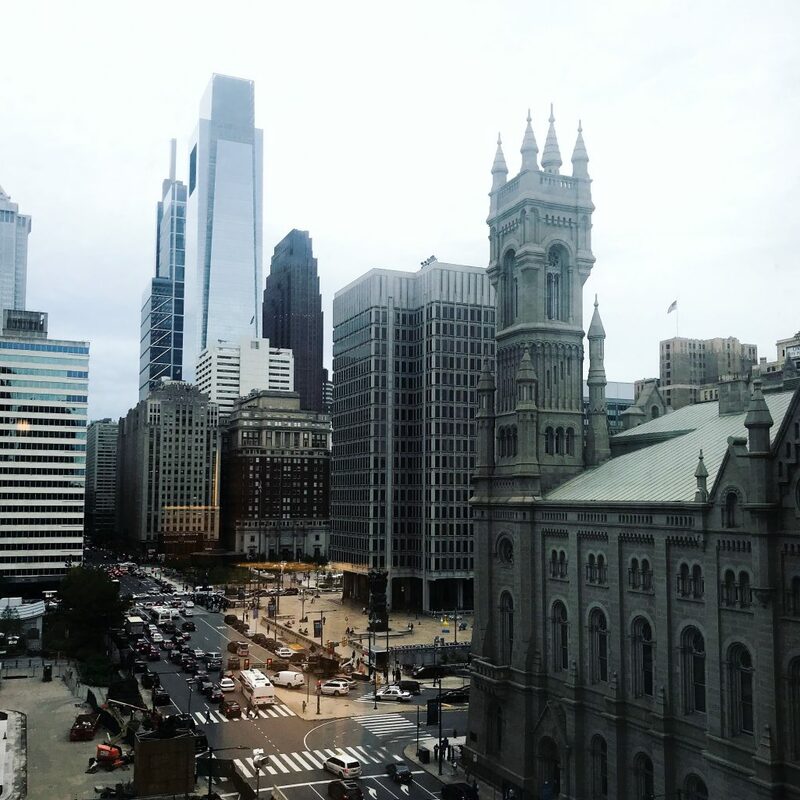 We only had a day to venture around the city, but we will definitely be going back to visit some of the amazing museums that Philadelphia has to offer. The Franklin Institute is definitely at the top of our must see list. It’s a science and technology museum with hands on exhibits on everything from electricity to the human heart. The Please Touch Museum is not your regular children’s museum. 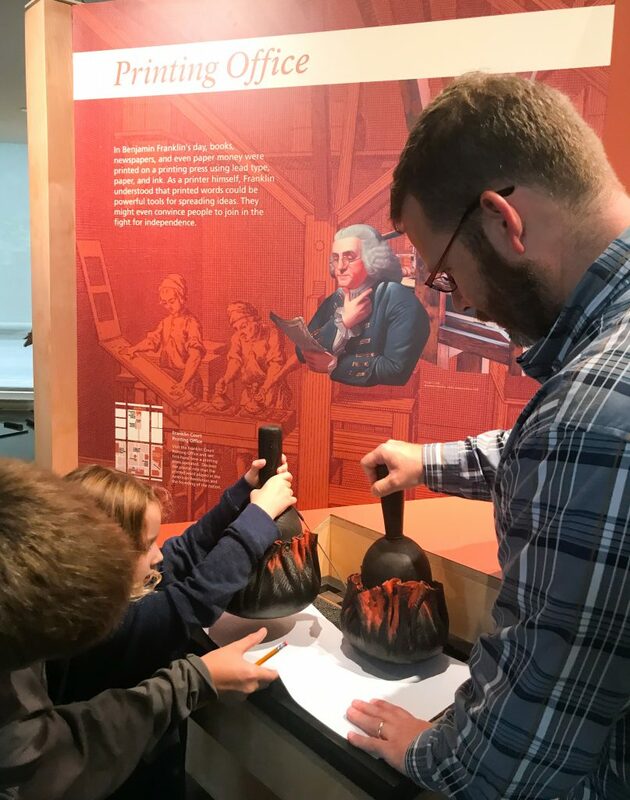 Geared toward the preschool and early elementary crowd, this museum has plenty of hands on experience to keep your little ones entertained. 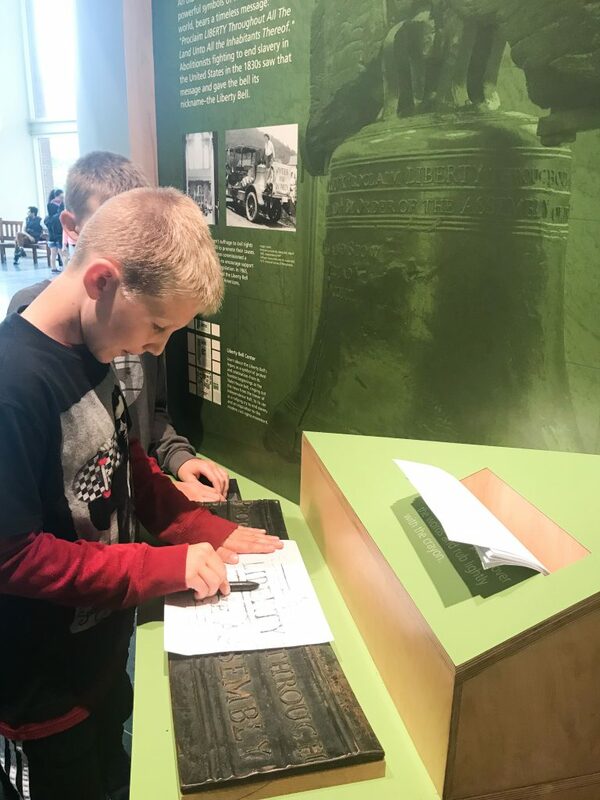 We highly suggest stopping by Independence Hall to soak in some of the history of Philadelphia. 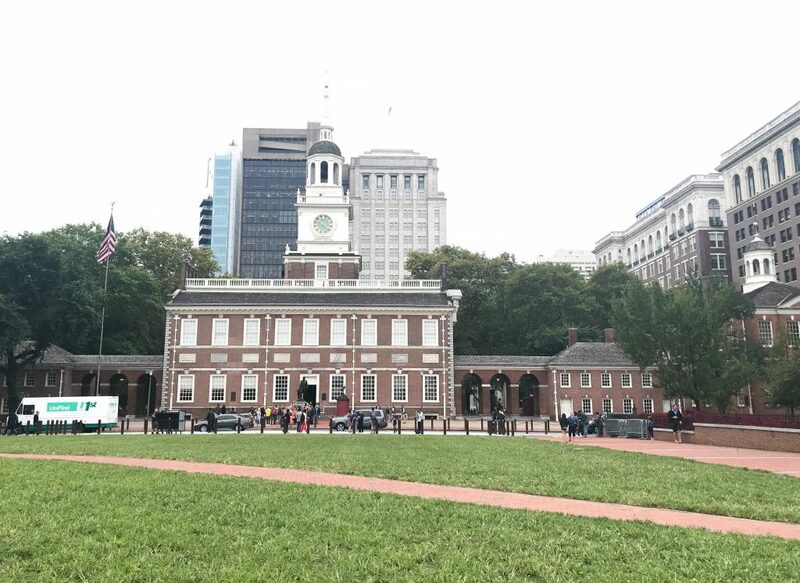 You’re able to tour this building where both the Declaration of Independence and U.S. Constitution were signed. Tickets for Independence Hall are distributed the same day are free. You’ll need to stop by the Independence Visitor Center on the day of your visit to pick up tickets with an assigned time. You are able to make ticket reservations in advance, but there is a $1.00 fee per ticket charged when making reservations ahead of time. Inside of the Independence Visitors Center are a bunch of free hands on exhibits that the kids really enjoyed. The President’s House Site is an outdoor free exhibit that doesn’t require tickets to enter. It’s located next to Independence Hall. Videos accompany the traditional descriptions that give you a glimpse into the lives of the enslaved individuals who worked in the house and their road to freedom. In the nearby Washington Square Park you can find The Tomb of the Unknown Soldier. Like any trip, especially a city location, we really suggest doing some research before you get there with the family. If there is a restaurant that you want to hit for lunch or dinner, try to make a reservation. Have a few different options for breakfast, coffee or lunch near the museums or places you plan on visiting. If you are looking for an EGGGcellent breakfast or brunch place, you need to check out Sabrina’s Cafe. They have a few different locations and they have a virtual wait list that you can add your name to before arriving to hopefully cut any wait time shorter. McGillin’s Old Ale House is the oldest pub in Philadelphia. 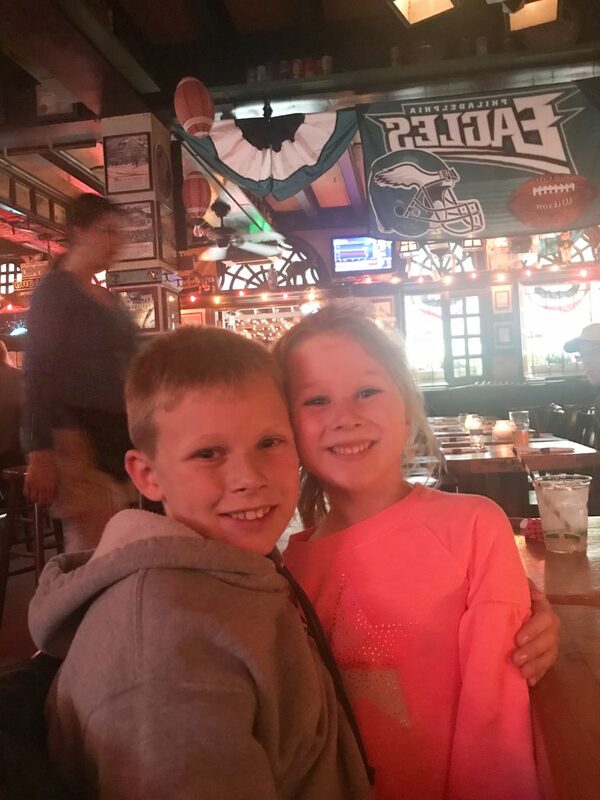 We stopped in before our concert for some delicious burgers, but they have a bunch of different yummy options on their menu. First up was Pat’s King of Steaks. 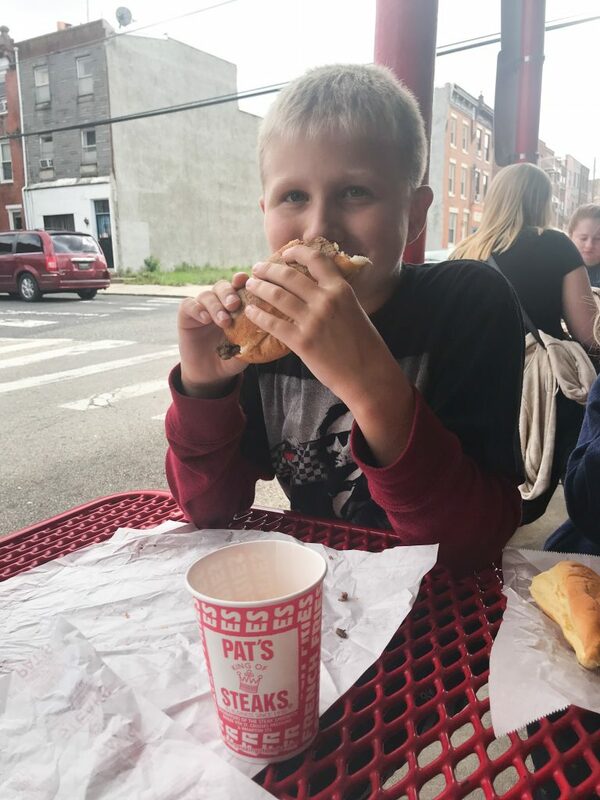 Pat’s advertises that they are the originator and creator of the cheesesteak. I can’t confirm that, but I do know that with after almost 90 years of business, there was still quite a line waiting to order. 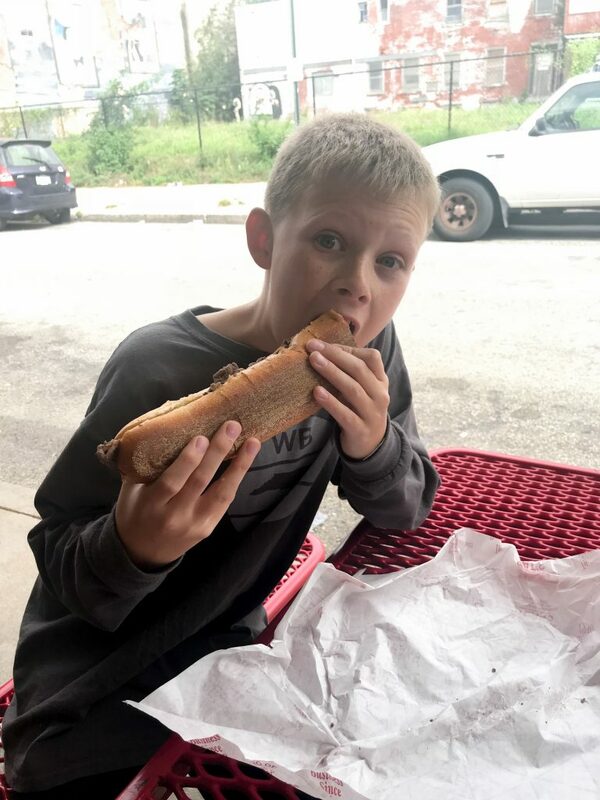 The cheesesteaks are ginormous but oh so delicious. We had a few that were big fans of both their fries and sandwiches. First timer tip… you will need to know your order before you get up to the counter. You order it “with” or “without” (onions), then specify if you want it plain or what type of cheese. You order any drinks and fries at the next window down. We failed at the ordering test on every level other than paying in cash 🙂 But they walked us through it and everything was delicious. Next up and right across the street is Geno’s Steaks. 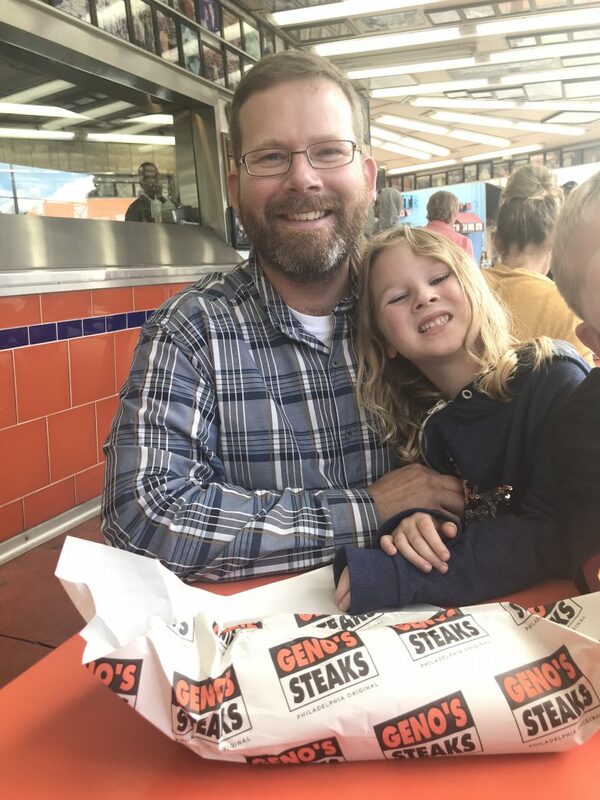 Geno’s opened a little over 3o years after Pat’s, but claims to be the best cheesesteak in Philly. 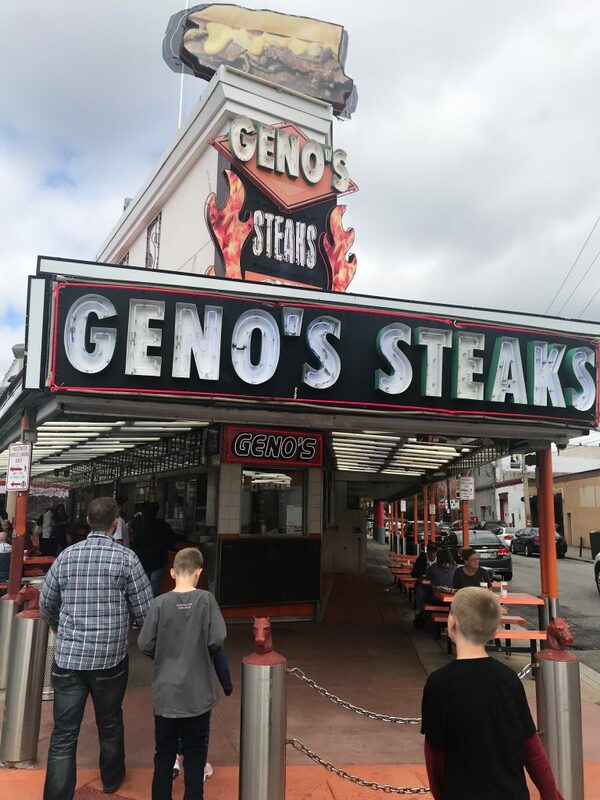 Geno’s had similar ordering to Pat’s and also only accepted cash. 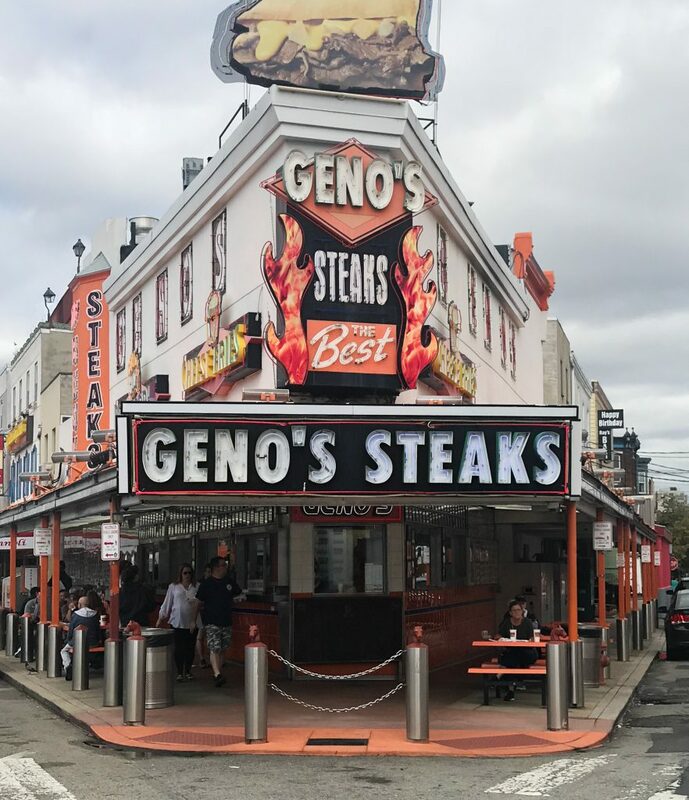 Geno’s won our vote, but it was a tough competition. It was a fun taste test with the kids. We all enjoyed splitting a couple sandwiches at each. 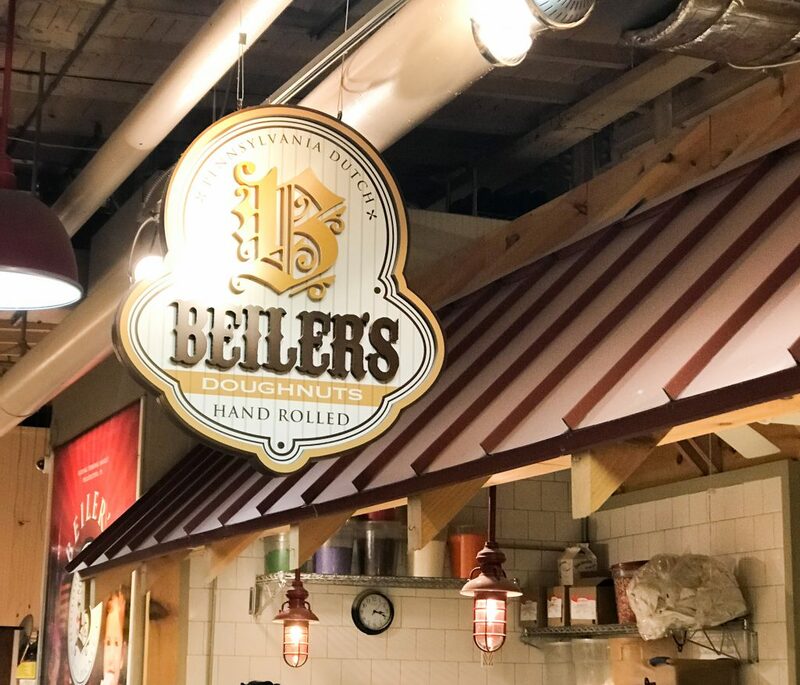 One our favorite places to fill our bellies was the Reading Terminal Market. It got a little crowded around lunch time on Friday, but we came back during an off peak time of day and there weren’t very many lines at all. The kids loved the Sweet as Fudge Candy Shoppe. 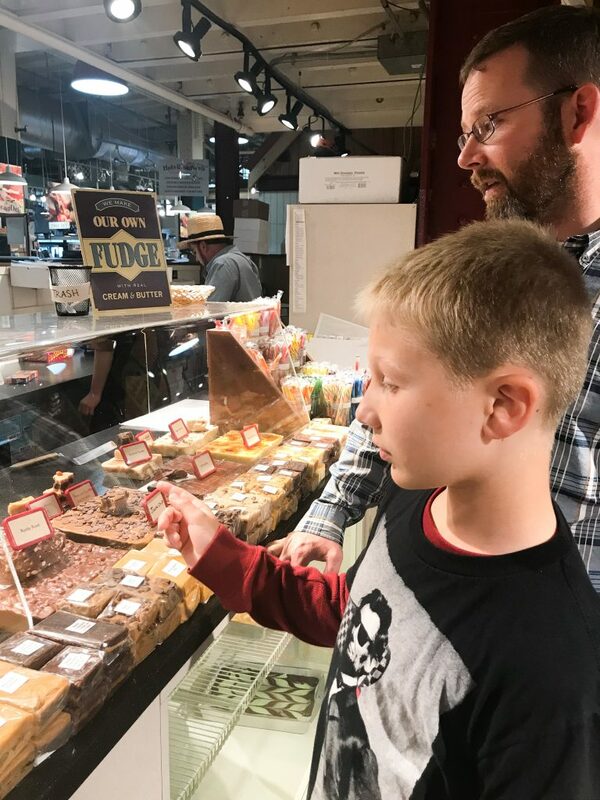 We tested a bunch of different flavors of fudge and purchased our favorites. There were all sorts of candy to choose from. 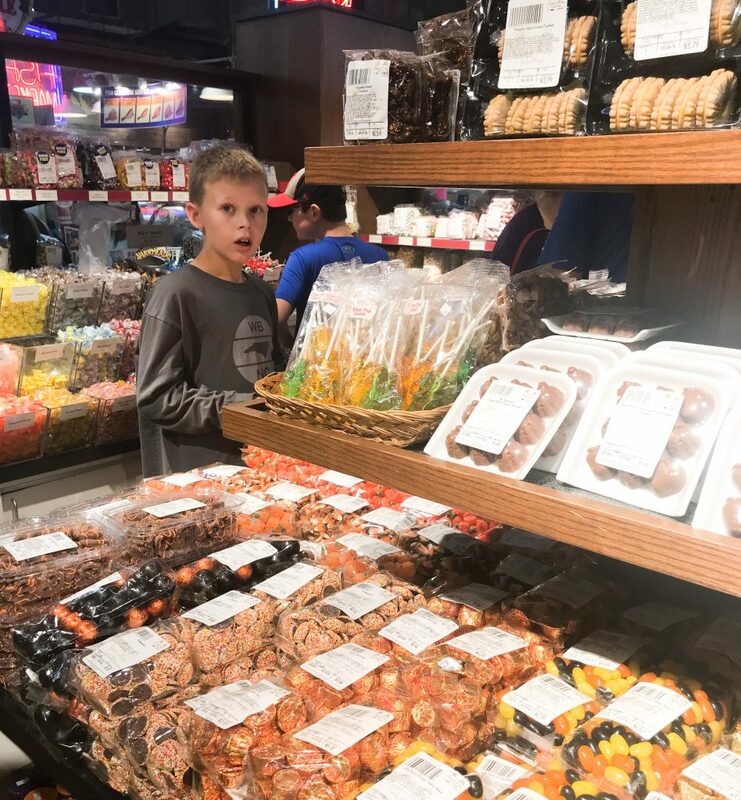 Since we visited in September, there were seasonal candies galore. The flower market had gorgeous flowers for sale and reminded me of our time at Pike’s Peak in Seattle. I wish these could have made the journey home! I don’t know if ya’ll have noticed a theme here, but we basically ate our way around the city. 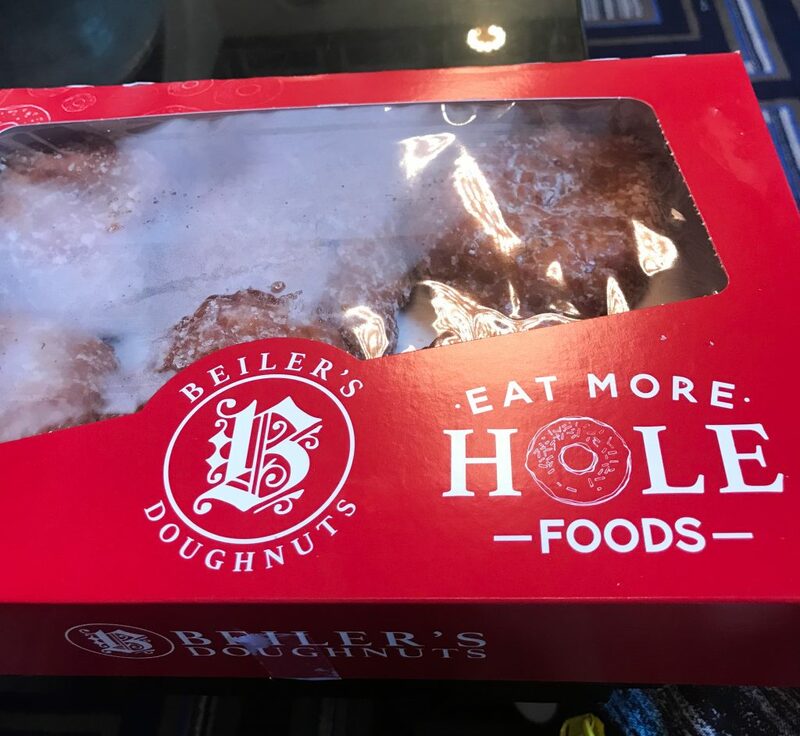 Beiler’s Doughnuts is a must see on the belly tour around Philly. These hand made doughnuts were melt-in-your-mouth delicious. 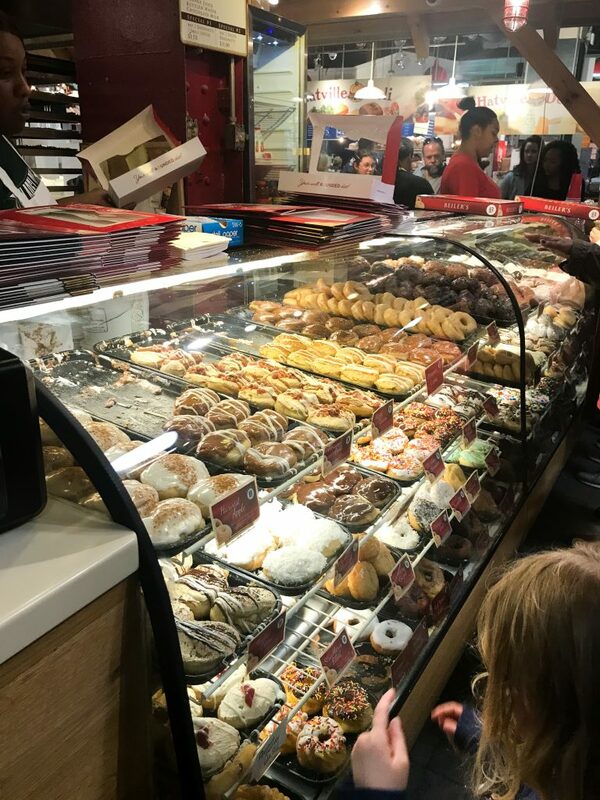 We all enjoyed watching them make the doughnuts right there in the market. Then it came time to make some decisions. I have seriously bought cars in less time than it took us to decide which ones were coming with us. They all looked insanely good. We settled on a dozen of apple fritters. Look at that steamy goodness. These are great to bring home for friends and family at home too. I’m not kidding ya’ll, next time we head up to Philadelphia I’m only packing stretchy pants. I almost forgot about these pretzels and made my hubby run back in to purchase some for the ride home. They were hands down the best hot pretzels we’ve ever had. There are sooo many other restaurants and venues to grab a bite to eat that we would love to try on our next trip up there. In between our many meals and museum trips, we really enjoyed just walking around the city and taking in the sights. We walked by this shop and were intrigued by all of the masks for the famous New Year’s Day Mummer’s Parade. It would be quite an experience to be in the city to experience that. The city at night was just lovely. I would have loved to spend another night strolling at taking pictures. This exhibit we happened to catch at the exact right moment at Dilworth Park next to City Hall. If you are in Philadelphia, you should definitely plan on experiencing it. Pulse is an interactive artwork by Janet Echelman. When the train passes underneath, an illuminated wall of steam shoots into the sky. We loved walking through it and seeing all of the different colors. 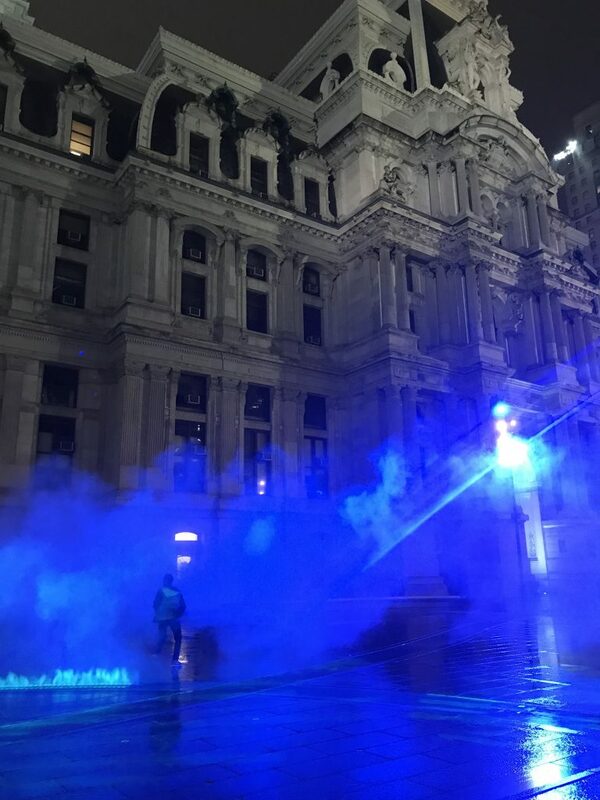 During the winter months there is an ice rink located at Dilworth Park and fountains to run through during the warmer months. We are already looking forward to our next trip to Philadelphia!